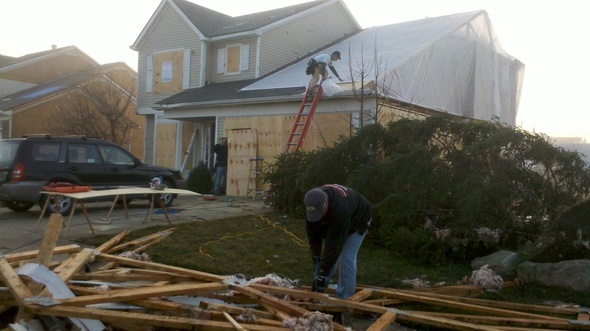 Posted on Fri, Mar 16, 2012 : 7:59 a.m.
Dexter is awaking to the aftermath of a tornado that damaged more than 100 homes Thursday, starting the cleanup process and assessing the damage. At Huron Farms subdivision, fog covered the neighborhood as people slowly started to converge on the area and the sounds of chainsaws could be heard. Crews from the Dexter Area Fire Department, cleanup companies like Statewide Disaster Restoration and multiple media outlets were stationed on the edge of the streets were an estimated 68 homes were damaged. "It's like a war zone in here this morning," said Erin Kennedy. She and her husband, Patrick, were waiting for their home insurance representatives to arrive. Their roof was partially blown off, and they had buckets throughout the home, catching water. An estimated 4,000 homes were without power this morning in Washtenaw County, most of them in the Dexter area. By 10:30, the number had dropped to fewer than 3,000. "Dexter is a priority today,'' he said. He cautioned people to stay away from downed power lines. "If there are wires down, treat them like they are hot," said he said. No deaths or serious injuries were reported Thursday night, officials said. "Typically, we are doing body counts in this kind of situation, but we don't even have any injury counts," said Dexter Area Fire Chief Loren Yates. Washtenaw County Sheriff's Deputy Ray Yee was the first officer on the scene in Dexter. However, estimates from the American Red Cross early Friday said 13 homes were destroyed. Many of them were concentrated in Huron Farms, but other properties - from Dexter-Ann Arbor Road through the village - sustained damaged. Among them: the laundromat and car wash at Mast Road. Sheriff Department officials are asking homeowners who have called in independent repair companies to make sure they have a work order and an address to gain access at the checkpoints outside restricted areas. A temporary shelter was set up at Mill Creek Middle School, but volunteers there on Friday morning said no one stayed there overnight. However, the outpouring of food donations kept it well-stocked for residents and emergency workers. Officials thanked people who have offered volunteer help, but it is not needed at this point. "This is a manageable situation, but we are happy to take donations," said Undersheriff Mark Ptaszek. At the Dexter Area Fire Department on Main Street in the village, Huron Valley Ambulance set up a mobile command center. Businesses in the village were open Friday morning. Normal traffic is 18,000-20,000 cars per day traveling through the village, but that count was dramatically lower this morning. Hackney Hardware opened at 7 a.m. Ben Howell, an employee there, said people were coming in to buy tarps, and the store had to order more electrical generators from Ohio. One reason for the quiet village streets: Downed trees were still affecting traffic, even as Washtenaw County Road Commission crews converged on the scene. Officials said Dexter-Pinckney Road will remain closed from Island Lake Road to North Territorial at least through the end of Friday as crews from the county Road Commission, private contractors hired by the county and crews from DTE clear the massive amount of trees that are blocking this major thoroughfare, which typically sees 18,000 to 20,000 cars per day. Rick Monier of Dexter Township tried to find a positive spin to the devastation. Michigan Gov. Rick Snyder is expressing thanks for the local and state authorities that responded swiftly to storms that spawned tornados in the state. 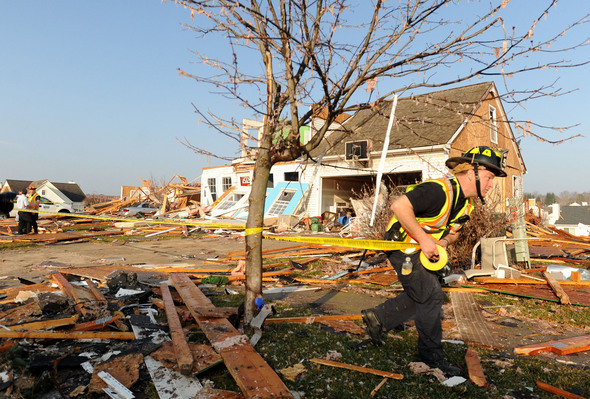 Snyder spokesman Ken Silfven said in an email Friday morning that Snyder is "thankful that there was no loss of life" reported following Thursday's storms. He says the governor is concerned for those who might have been injured and those whose homes or property were damaged. Silfven says there haven't yet been any requests for state emergency aid. Eight fire departments responded to assist Dexter with the Dexter tornado aftermath: Manchester, Chelsea, and the townships of Putnam, Hamburg, Scio, Saline, Northfield, and Ann Arbor. Washtenaw County Tactical Rescue, Michigan State Police, Livingston EMS and Huron Valley Ambulance also were on the scene. If you would like to help, please donate to the American Red Cross Disaster Relief Fund. Donations of food, clothing and other items can not be accepted. If you would like to make a donation, call 734-971-5300 or visit wc-redcross.org to make a secure online donation. Donations are also welcome in person at the American Red Cross, Washtenaw-Lenawee Chapter, 4624 Packard Road, Ann Arbor, Michigan, 48108. Contributors to this story include: Lizzy Alfs, Danielle Arndt, Lisa Allmendinger, and the Associated Press. Cleanup crews working Friday morning in Huron Farms, near the corner of York and Noble. Those streets were hardest hit in Thursday's tornado. A Dexter firefighter tapes off the most damaged houses in Huron Farms neighborhood Friday morning after a tornado hit Dexter on Thursday. Sat, Mar 17, 2012 : 10:33 p.m. I thank God no one was hurt!!! How do we help physically? Can we help with the clean up? I know local authorities said we can't get past yet without an address, but I am a person in Ann Arbor with no one I know who lives in Dexter. Will there be future opportunities? Also, please update the dates; the tornado happened March 15, 2012. We would like to remember this date accurately for future references. Sun, Mar 18, 2012 : 12:28 p.m. I have helped the last two days along the railroad tracks by the Dexter Mill. Find a spot where people are cleaning up and tell them you want to help. Bring gloves and hearing protection as the saws and heavy equipment are loud. You can also go to the fire station on the west side of town and ask there where they need help. Fri, Mar 16, 2012 : 5:47 p.m. It is truly a miracle that no one was seriously injured. This was the worst storm I have ever seen come through this area. After approaching the city, it stopped moving, and just sat over our heads for 2+ hours pummeling us with hail and tornadoes. Food and clothing donations can be made to the Food Gatherers, a fine organization operated by Zingerman's that is providing disaster relief. If you can get down there yourself to help, even if you can't do much, I'm sure the gesture would be hugely appreciated. Speaking from experience, there is nothing like receiving selfless help from strangers at the hour of greatest need. It forever revives your belief in the innate good of humanity. Take care everyone. My thoughts go out to those who lost everything. It is a difficult day but the most important thing is that everyone is alive. You can't buy another life. Fri, Mar 16, 2012 : 6:54 p.m.
Hi Don, Here at Food Gatherers we are also thankful that no one was injured and are grateful for efforts of the emergency personal who are on-scene helping with the cleanup. For people wanting to donate to the IMMEDIATE relief efforts, they can visit the American Red Cross- Washtenaw and Lenawee County Chapter website,www.wc-redcross.org. For people wanting to assist in the longer term recovery efforts, United Way has established the Dexter Area Tornado Relief Fund at www.uwgive.org. 100% of donations will go directly to help the community. Food Gatherers is working closely with both the Red Cross, the United Way of Washtenaw County and our local partner Faith in Action to ensure that the individuals affected by this storm have access to emergency food resources. At this time, we have the food supplies necessary to meet that demand, but we always welcome donations of non-perishable food items to support our ongoing hunger relief efforts throughout the county. Donations may be dropped off at Food Gatherers Warehouse, 1 Carrot Way, Ann Arbor, MI 48105. Please note that Food Gatherers does not accept donations of clothing. Mary Schlitt, Director of Development and Marketing, Food Gatherers P.S. We did get our start as part of Zingerman's but now we are all grown up - an independent non-profit organization. &quot;No deaths or serious injuries were reported &quot; Weren't two Ann Arbor fire fighters electricuted by a down wire? Whats the update on their status? Do they not count? Fri, Mar 16, 2012 : 7:25 p.m. Same storm just a few miles east and there isn't even mention of them on the front page. The only injuries in this whole debacle are to two of our local heros and nothing about them from you. I'm disappointed in your priorities. Fri, Mar 16, 2012 : 5:46 p.m.
We'll get an update. They certainly do count! They just weren't injured during the Dexter tornado, which is the focus of this story. Every emergency responder did a stellar job yesterday, based on what I saw. Scary night. Fri, Mar 16, 2012 : 2:23 p.m.
Paula, you buried the lead! Deputy Yee's experience ought to be the first thing people read! Fri, Mar 16, 2012 : 2:44 p.m. Completely agree that it's compelling. We're dealing with a ton of info this morning, and I've got a reporter in the driveway of the house where the man was rescued. We've been hoping for a least an hour to get to talk to the man himself, and don't have his name confirmed (at least as of the last time I talked to Danielle). Was hoping to pull that element out soon. After standing in that driveway last night, I'm completely amazed and thankful that the man was OK! Fri, Mar 16, 2012 : 2:01 p.m.
&quot;Yee approached one destroyed home Thursday, and saw a hand sticking out of the rubble. He pulled out an elderly man, who was shaken but walked away.&quot; This is amazing. How is this not the lead? &quot;Insurance can rebuild&quot;. Hopefully that is the type of coverage they have and not the more typical one that reimburses at what it would sell for which can be a huge difference. Sun, Mar 18, 2012 : 4:05 a.m.
Murf, why comment on something so serious to some as this issue, without having a clue as to what it is your commenting about? All homeowners insurance policies sold in the State Of Michigan are Replacement Cost Policies on the structures and 95% of the policies also have replacement cost on the contents. The other 5% of contents policies that aren't replacement cost are Actual Cash Value Policies that pay much greater than market value which is the type of insurance I believe your referring to, they haven't had a Market Value Policy in this state for a homeowner in the 35 years I've been involved in property and casualty claims. Today's policies are written with the intent to, at the very least, restore you to how you were previous to the incident. Rest assured the policies written for the homeowners involved in this disaster are going to cover all your homes and the personal property in them along with the costs associated with moving into temporary residences while your homes are being repaired/replaced. Fri, Mar 16, 2012 : 1:12 p.m.
how is the De3xter Mill? Fri, Mar 16, 2012 : 2:48 p.m.
A couple of the outbuildings were destroyed but the store and main building are standing. The cider mill was very lucky as well. The giant oak tree outside the cider mill is down but it fell away from the building. Fri, Mar 16, 2012 : 1:25 p.m. The building is intact. A massive tree next to it fell in the other direction. Fri, Mar 16, 2012 : 12:54 p.m.
&quot;No deaths or serious injuries were reported Thursday night, officials said.&quot; Thank goodness no one was hurt or injured. My heart goes out to all these families who have lost their homes, valuables, and sense of security. Kudos to area weather analysts for providing such detailed information about the ongoing storm and tornado warnings. How about an aerial photo of the affected areas? ?